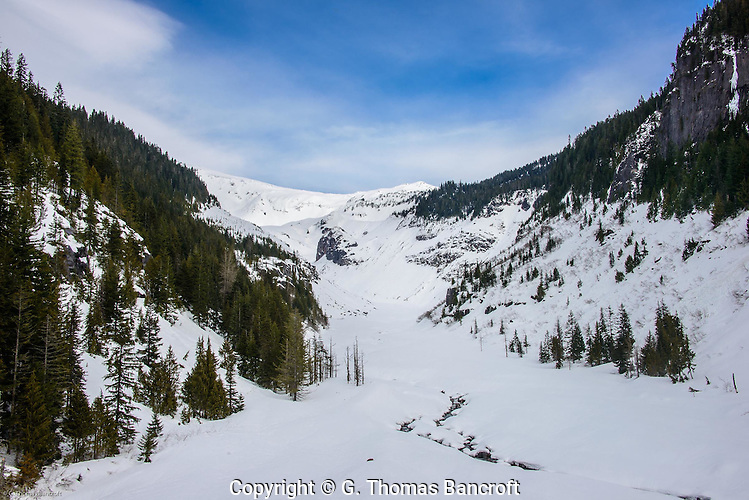 26 February: I left Longmire, to hike along the Wonderland Trail beside Nisqually River. 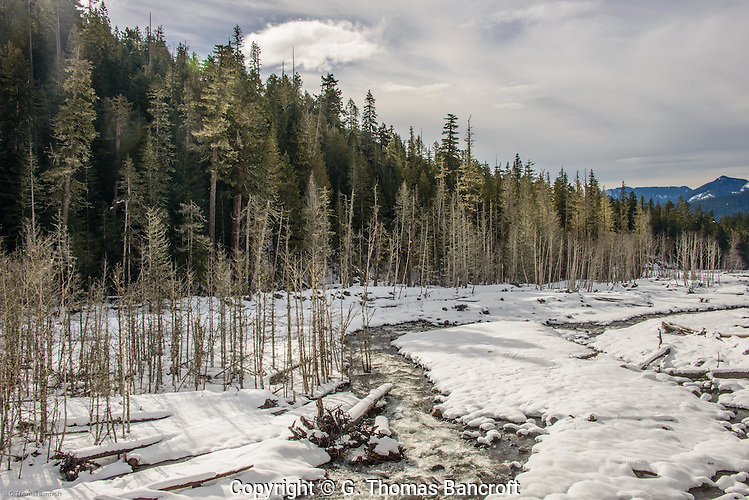 The trail weaves through a forest of silver firs and bumps up to the edge of the river’s bank. The bank drops precipitously 30 or more feet to the wide bed where the river twists and turns back and forth across the bed. Debris flows and floods from the Nisqually Glacier scraped the bed wider than the normal flow needs. Leafless red alders cling to gravel bars and create a border between open bed and fir covered higher areas. 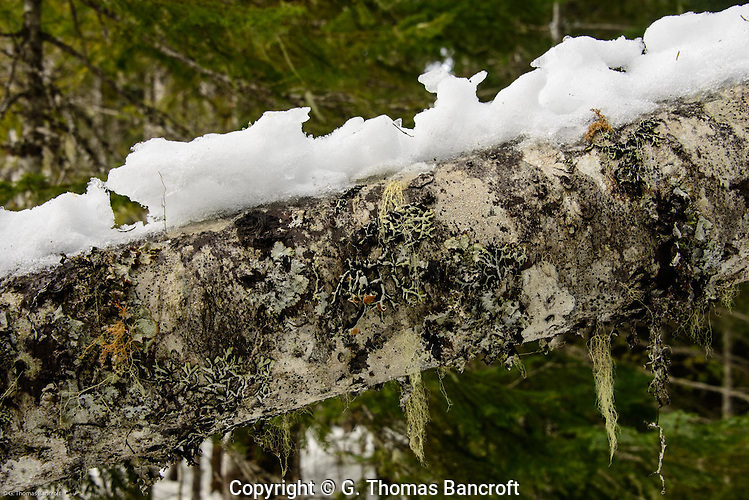 Several feet of snow cover the ground and clumps of snow hang on branches in trees. The clumps give way in the warm temperatures, crumbling through branches, giving a little sound to the quiet forest. Water drips from branches almost like a light drizzle. Because the temperature is just above freezing , the snow is heavy and it hangs tight to my snowshoes, making the going tough. About 1.6 miles into my hike, the trail drops down to cross the river where Paradise Creek joins the Nisqually. 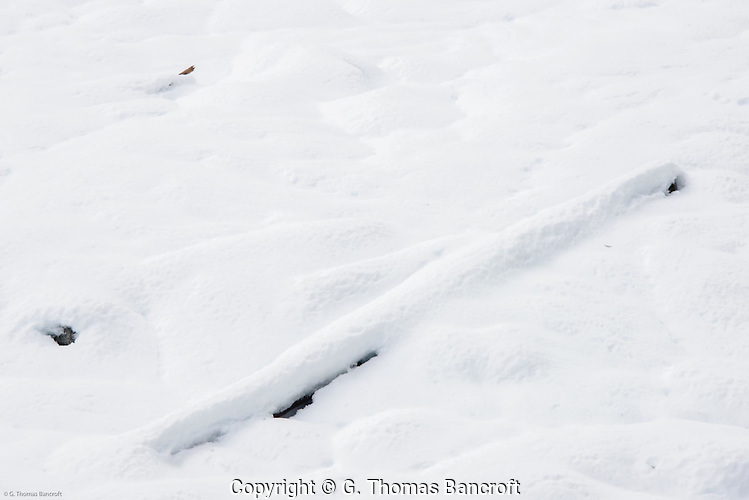 I scramble over several hundred feet of snow covered gravel and rocks to reach the water’s edge. The actual flow is about 20-feet wide and a log bridge provides a way for me to cross. 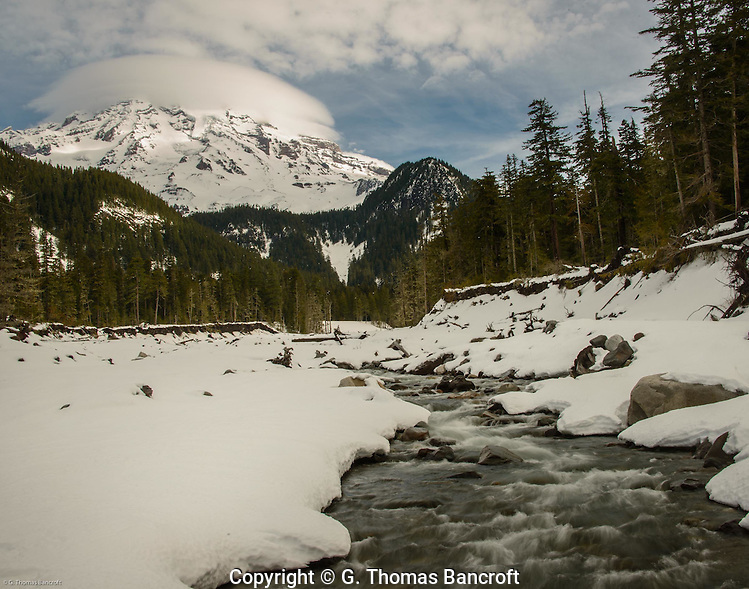 As I look upstream, a lenticular cloud clings to Mt Rainier like a winter cap pulled down over its ears. The wind blows strong, gusting to 20 or 30 mph. Twice I almost fall over and end up sitting on the log to watch the clouds blow across Mt Rainier. 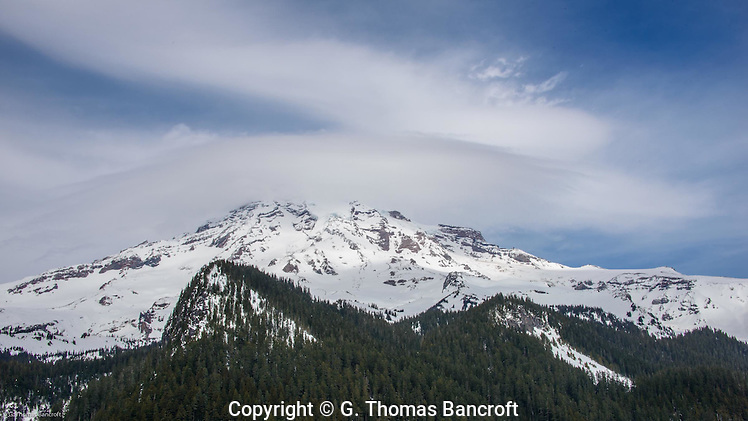 Lenticular clouds form when moisture-laden air blows over a mountain. As the air rises to cross the mountain it cools and if it drops below the condensation point, a cloud forms. On the lee side of the mountain, the air warms as it descends and the cloud disappears. The lenticular cloud looks much like a lens above or over the mountain. I watch the clouds drift from the northwest toward the southeast for half an hour to see if I can spot more of the mountaintop. It never appears so I decide to head back to my car. Thanks, Jaclyn, great to hear that Stix’s is graduating. We are doing well. Pretty neat! Time for spring though!